There are several ways to put fish on your table: pole and bait; rod and reel; net. But how many people consider using a bow-and-arrow to bring in a large fish, during one of the most exciting and enjoyable fishing expeditions you’ll ever experience? You might be able to have success with a standard bow and arrow, but you’ll have to make some slight modifications so you don’t lose the arrows! 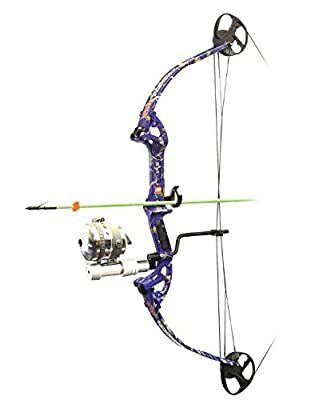 It would be best to take some time to learn about the best bowfishing bow, which is special archery equipment designed and manufactured for the purpose of archery fishing. With the correct equipment and a bit of practice, you can be a bow angler. Keep in mind, you will be after few types of fish. The list includes freshwater species such as common carp, catfish, bowfin, alligator gar, even tilapia. If you want to pull in some saltwater fish, your targets will include flounder, barracuda, and even rays and redfish shark, if you’re so inclined. 2 What Makes the Best Bowfishing Bow? This activity is similar to spearfishing because both involve substituting a specific weapon in place of a hook to get the fish. You can stand in your boat or in shallow water with a speargun or you can take the same positions with a special bow-and-arrow combination. As mentioned, with a bit of practice you can develop into a successful fisherman with this equipment. There are a few differences between the traditional archery arrow and bow, and the best bowfishing bow. The primary difference is in strength and weight. A bowhunting arrow is manufactured with heavier fiberglass or aluminum so it can travel through water and pierce its target. The fiberglass may be strengthened with carbon fiber. You’ll find that the bowfishing arrow won’t travel as far as a standard arrow when both travel through the air. The special arrows for fishing don’t have the feathers or “fletching” you find on archery arrows, simply because this would cause deflection in the water, as opposed to giving the arrow balanced flight through the air. The arrowhead for bowfishing also has barbs that help capture the fish and the arrow is connected to a reel and slide. The line used in this sport can vary from 80-pound test to as high as 400-pound test, depending on your target. Some line weights go as high as 600-pound test, if you want to hunt an alligator. Reel types include spincast, retriever, and hand-wrap, again depending on target and personal preference. You should take your time to learn more about how each works before making an investment, but the manual, hand-wrap is self-explanatory. 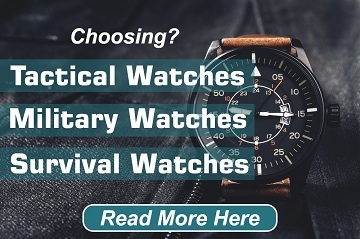 You might also invest in polarized sunglasses to reduce glare, hip-waders for staying dry, hand protection such as the right type of gloves, and a boat with a flat-bottom for stability. If you’re going to hunt at night, you’ll also need a good, waterproof light. As mentioned, you’ll need practice to become accurate with you bowfishing bow. Water causes a refracted image of the fish. Veterans advise aiming a bit low, then lowering your aim a little more. What Makes the Best Bowfishing Bow? With that brief introduction to the sport and equipment, it’s time to take a closer look at the main item on your list, the best bowfishing bow. What specific features and benefits should you look for when shopping for this bow? First of all, if you haven’t been involved in this sport before you might want to look at a complete package or kit that gives you the bow and all the accessories you’re going to need to be comfortable and successful. You should also pay attention to such factors as bow length, brace height, and peak draw. You’ll need to combine these and other elements with cost when shopping and making your choice. While personal needs vary, you might start looking at axle-to-axle length in the 31-inch to 32-inch range. It’s also important to have adjustable draw length, with a range from about 17 inches to just above 30 inches. You should also pay attention to draw weight, with an adjustable range from the high-20s to 40 pounds. Some of the more powerful equipment will have peak draw weight up to 50 pounds. If you choose a bow with weights in triple digits (100 pounds and up) you’re probably going to be hunting some waterborne monsters. You should also look for a bow with an actual carrying weight of about 2.5 pounds to just above 3 pounds. For those who haven’t taken part in this pastime, you probably won’t do better than the PSE Kingfisher kit. It gives you all the equipment you need to get you to the water, with a good chance of fishing success. It’s lightweight, at under 3 pounds, so it’s great for smaller individuals and younger anglers, yet it puts the arrow where it should be with accuracy. You’ll also find it smaller and easy to carry, but it will also serve the serious bowfishing individual quite well. The reel is front-mounted and comes with 80-pound test line, so you can go after some of the larger fish in your chosen area. It fits the bill at 31-inches long and has an arrow rest that will work well for novice or veteran. You can meet most of your bowfishing needs with the 45-pound draw weight. While you’re learning about PSE Kingfisher, you might want to consider the package/kit that also includes a bow from this company. However, this package comes with 130-pound test line and a 50-pound draw weight, combined with an AMS 310 Retriever. These numbers give you a good idea why the kit is marketed as “advanced.” You get finger protection with well-designed tabs and arrow rest of the roller design. The kit includes two Sure Shot arrows. You can depend on this package to deliver great function right out of the box, as the manufacturer has included well-placed and necessary shock pad, bushings etc. You’ll benefit from the AMS safety slides and the rugged construction as well. When the company started planning this great bowfishing bow, the ultimate goal was to satisfy people who wanted to be able to fish “to the extreme.” With a length just above 32 inches and peak draw of 50 pounds, you’ll be able to go after some of the bigger fish in your selected water. The design also includes a constant-draw module and draw-specific module, with adjustable draw length of 17 inches to 31 inches. Basically, it meets all the requirements of the best bowfishing bow. You can buy this one as bow-only, or you can purchase the complete package. 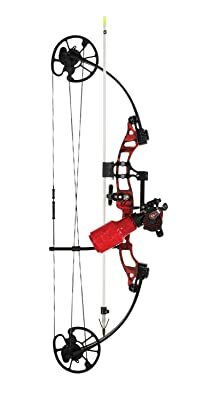 Arrow rest and finger protection are more than adequately provided for, and you get two fiberglass arrows (piranha tips) as part of the package. With all the performance capability, this bow is still quite manageable at only 3.2 pounds. If you want to jump into this sport somewhere above the “average” level, this is a no-compromise, consistent choice. Going back to the PSE brand name – If you’re looking for the best value to get started in bowfishing, or to become a better angler, this might be your choice. 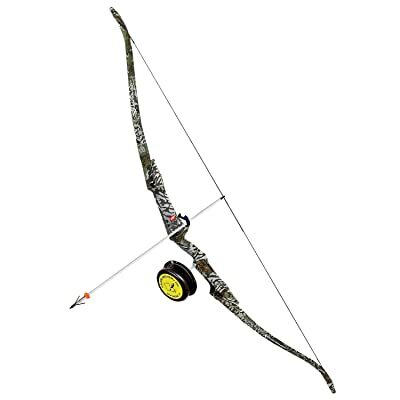 The package includes comes with two piranha-tipped arrows and a great bow with 31.5 axle-to-axle length. Adjustable draw weight ranges from 27 pounds to 40 pounds, so you’ll get all the power you need to capture tough fish. Draw length ranges up to 30 inches and brace height is designed for minimum effort during your activity. Package includes AMS reel, safety slide, and of course, the light, 2.7-pound bow. To get the most for you money, this is an outstanding choice. Looking at great packages at attractive prices, you’ll probably come across the Arrow Precision Frenzy at some point. It’s a solid option at a low price. The bow weighs 3.6 pounds, so it’s still in the comfortable range. The textured riser allows for the addition of standard accessories you might want, making this an ideal beginner kit. Witht the kit, you receive 80-pound test line (30 yards), standard reel, and one fiberglass arrow with barbed tip. This is a practical, usable package for beginners and for younger anglers. 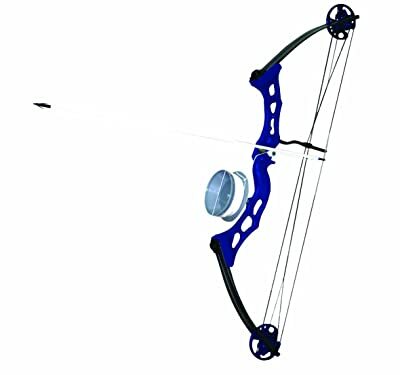 Stepping outside the traditional bow design, this is the best choice for those who want the unique, accurate performance of a crossbow for their fishing expeditions. It’s suitable for both saltwater angling and freshwater activity. This balanced and lightweight crossbow has solid construction and a great cam system, plus it offers draw weight adjustable from 100 pounds to 125 pounds. This might be your choice for those mid-sized fish as well as for the biggest targets. Bowfishing has been a food-gathering method for centuries. With the improvements in bow technology, arrow design, and the availability of new materials such as fiberglass and aluminum, it’s become an even more accurate, enjoyable way of fishing. You can hunt for bottom-feeding fish and other tough water game with the right bow-and-arrow combination, and carry a lot of fish to your camp or home. Choose a novice kit to get started, or go with the best (Cajun Sucker Punch, PSE, Parker crossbow) if you want to bowfish at the next level. 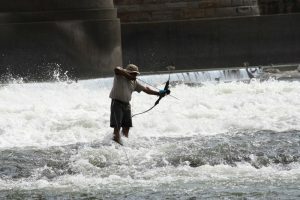 Bowfishing is gaining in popularity, not only with people who want to fish at a different level but also with hunters who like the bow-and-arrow method on dry land. Spend a bit more and get good equipment. You’ll be glad you did.